These two attractive people in L.A. may convince some other attractive people in L.A. to give their movie an award at a party for attractive people in L.A.
“La La Land” started its journey to favorite slowly. 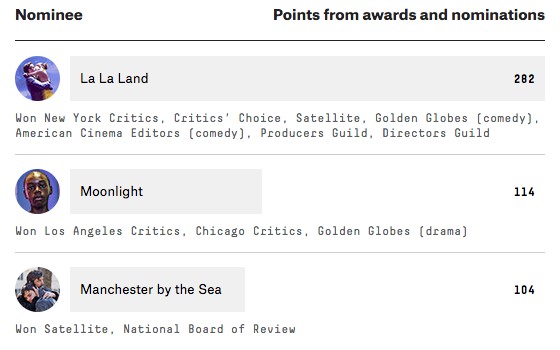 Two of its rivals, “Manchester by the Sea” and “Moonlight,” competed head to head in the drama categories at the Golden Globes and American Cinema Editors awards, both worth more points than the considerably lamer comedy or musical categories that “La La Land” competed in at those shows. In recent history, dramatic movies have tended to win Oscars more often than comedies and musicals, so this was one reason for the initial and healthy “La La Land” skepticism. Only two weeks ago, this was looking very much like a three-film race. “Moonlight,” “Manchester by the Sea” and “La La Land” had each swayed critics. There were three very predictive awards coming up — the American Cinema Editors’ drama prize, and the top awards at the Producers Guild and the Screen Actors Guild — and “La La Land” was only up for one of them (the PGA). But rather than reward one of the film’s closer rivals, the editors recognized “Arrival” while the actors rewarded “Hidden Figures” — both of which are nominated for best picture but are massive underdogs. And when the PGA went with “La La Land,” the film came out of the weekend the big winner. The Directors Guild awards are the most predictive award that we follow in this category: 19 out of the past 25 DGA winners’ movies went on to win the Oscar for best picture. So “La La Land” is definitely the favorite. But, hey, surprises happen; maybe the New Englanders will devastate the nation and pull this one out.